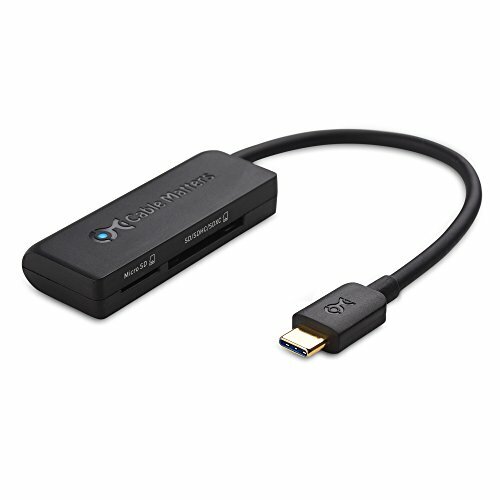 The Cable Matters USB 3.1 Type-C SD Card Reader is an essential data storage companion for a compatible smartphone or computer with USB-C or Thunderbolt 3. Access data from both cards simultaneously and securely transfer and store data with an SD card at speeds up to 5 Gbps. Thunderbolt 3 equipped devices now use the slim, reversible USB-C connector. Computers and OTG compatible smartphones with a USB-C or Thunderbolt 3 port can use this USB-C SD Card Reader. DUAL SLOT USB-C CARD READER provides convenient access to SD, SDHC, SDXC, and microSD cards from a host computer or smartphone with a USB Type-C port or Thunderbolt 3 port; USB C memory card reader can access data from both cards simultaneously for downloading files from a video camera to your computer; USB-C SD card reader offers fast data up to the USB 3.1 data transfer rate of 5 Gbps; Ideal accessory for an OTG enabled smartphone without a micro SD card slot. FLEXIBLE USB C CARD READER with a 6 inch cable tail does not block adjacent ports and provides easy access to insert and remove your SD cards; Hot swap support on the SD adapter eliminates the need to unplug and re-plug when changing cards; Portable bus powered Thunderbolt 3 card reader is compatible with smartphones with USB Type-C such as the Samsung Galaxy S8, Note 8, OnePlus 3, Nexus 5X / 6P, Lumia 950 / 950XL, LG G5, V20, and HTC 10 / U11.